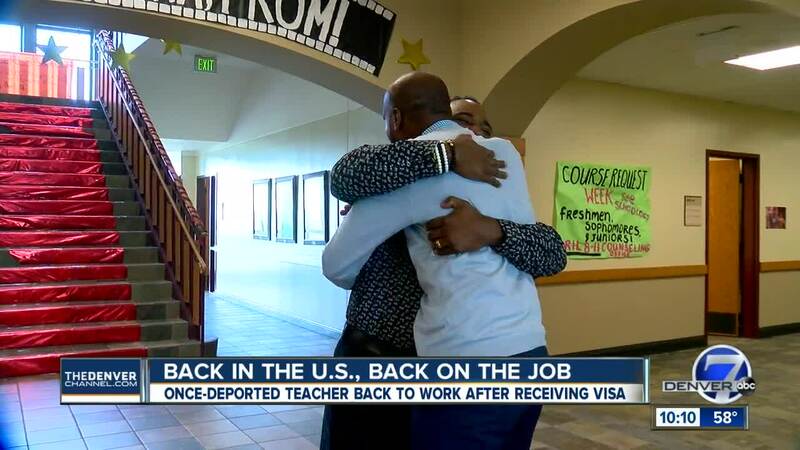 HIGHLANDS RANCH, Colo. — A popular teacher at Valor Christian High School in Highlands Ranch is back in Colorado after being forced to return to his native Kenya after his visa expired. Anthony Wanjiru returned to the U.S. on Sunday after a miraculous chain of events allowed him to return to his adopted home of Colorado. "I was super surprised," he said. "It's a miracle, to be honest with you. It's a miracle." He reluctantly returned to Kenya last month after last-minute efforts from Valor students to try to keep him in the U.S.
Wanjiru had spent eight years in America volunteering with youth groups and at the Rescue Mission, in addition to his time as an instructor. Upon his arrival in Kenya, he quickly realized he had garnered some positive press. "The story had gone viral, and people in Kenya knew what was going on," he said. Last week, he met with a woman at the American embassy in Nairobi. He told her his story. "So the lady was like ‘OK.’ They approved my visa without any questions,” Wanjiru said. After a canceled flight and 24 hours of travel, he looked out the window of his plane near Denver International Airport Sunday and burst into tears. "The mountains are a sign that I'm home," he said. Valor offered him his job back that led to this emotional reunion at Valor on Monday. Wanjiru's visa has been approved for three years, but he says nothing is guaranteed. He's now beginning the year-long process of getting a green card to allow him to stay here permanently.